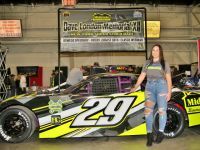 With Oswego Speedway’s 66th season opening event just days away, several race teams have test sessions planned throughout the week in anticipation of the first green flag of the season on May 14, presented by Mitchell’s Speedway Press. The first session of the week is scheduled to be run on Tuesday from 4-8 p.m. for the Hedger Fabrication Pathfinder Bank Small Block Supers of Russ Brown and Cameron Rowe. Rowe hit the Speedway during Saturday’s open practice session in his No. 77 cutting a fast lap of 19.694 seconds in his first laps behind the wheel of the racer. Rowe is hoping to work closely with chassis builder Ray Hedger on Tuesday to cut those times down further. Brown, who set fast time for last year’s Bud Light SBS Classic 75 with a lap of 18.695 seconds, is the current SBS track record holder and is looking for his first track time of the 2016 season. 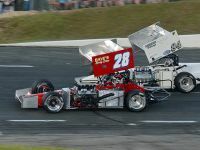 The next session planned for the week is Thursday, May 12 for the Graham Racing Supermodified stable, again from 4-8 p.m. The only Graham Supermodified on track during the Speedway’s open practice on Saturday was Pat Lavery. Lavery quickly dropped into the 16.8 second bracket in the machine he will race as No. 12 this weekend. The all-new No. 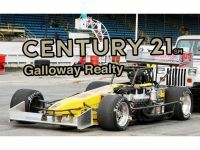 21 Supermodified to be driven by Kody Graham and Aric Iosue’s No. 11 machine were in the pit area last weekend, but only to fire their engines. The full Graham fleet is expected to be at the Speedway Thursday. Friday evening will be the first Fast Friday test session of the season with several cars currently signed up for the four hour practice running from 4-8 p.m.
Supermodifieds scheduled for Friday include the Jeff Abold No. 05, Michael Barnes in the No. 68, Bill Sharkey’s No. 71, the Joe Gosek No. 00, and the John Nicotra Racing team. Joining those Supermodifieds as of now will also be three RoC Modifieds with drivers Jimmy Zacharias, Austin Kochenash, and Kalvin Carroll. Racing action at the Speedway begins on Saturday, May 14 featuring the Speedway’s 66th consecutive opening night presented by Mitchell’s Speedway Press and highlighted by the Race of Champions Modified Richie Evans Memorial 61 as well as kick-off events for the Novelis Supermodifieds and Pathfinder Bank SBS.